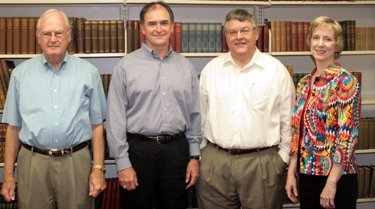 Magale Foundation Trustees from left, Homer Greer, Doug Thomas, Timothy Quinn and Robin Branim in the Magale Room at Southern Arkansas University. The Magale Foundation Trustees have long been friends of Magale Library and the SAU Band. MAGNOLIA—Students in the Southern Arkansas University band could be using instruments older than they were, but generous donations from the Magale Foundation Trustees have allowed for the purchase of more modern equipment. On Wednesday, several trustees of the Magale Foundation visited Magale Library on campus—named in honor of John F. and Joanna G. Magale —and heard what an everyday impact their donations have made. University Director of Bands J.P. Wilson said they have helped replace some equipment that was at least 40 years old. “We performed a concert last spring that we would not have been able to perform other wise,” Wilson said. 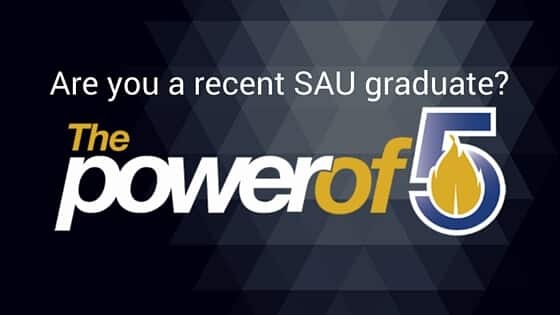 Wilson, who begins his 10th year as director of bands this fall, said the improved equipment provides a recruiting tool to attract students to SAU. In the past five years, the band has grown about 35 percent to its current roster of about 120 students, and Wilson credits the Magale Foundation for much of that. SAU Foundation Director Jeanie Bismark, and Associate Director of Development, Josh Kee, hosted the Magale Foundation trustees, Archie Monroe, former trustee, and Doug Thomas of J. P. Morgan for a tour around campus. The highlight of their visit was the Magale Room in the library which features books from the original Magale residence on North Jefferson Street. The volumes are kept in this room because it provides the most humidity control available said Daniel Page, who took over the post of the Magale Library director this July. The relationship between the Magale family and the University has a history of its own. John F. and Joanna G. Magale were friends and benefactors of SAU for many years during their lives and through their estates. In 1975 they established the “John F. and Joanna G. Magale Trust Library Fund for Southern State College,” which promoted naming the library in their honor. Over the years, they established endowments that continue to provide scholarships for current students, as well as academic enrichment funds for the University in the Colleges of Liberal and Performing Art and Education. Most recently, the Magale Foundation has provided grants to the band program, helping to develop the band into one of the finest marching bands in the Gulf State Conference.